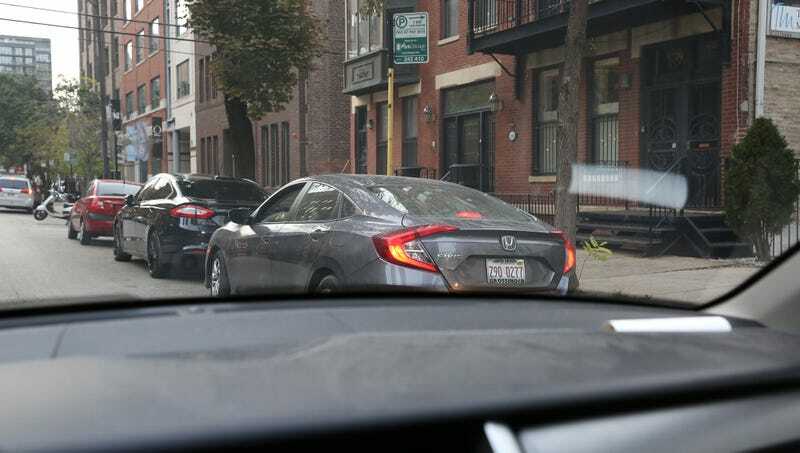 PHILADELPHIA—Craning for a suitable vantage point from which to observe their subject’s movements, local car passengers launched an urgent, mid-street investigation Wednesday into whether a woman in the parking spot they wanted was coming or going. “Her lights are on, but do you see which direction her car is moving?” asked lead detective Natalie Margulies, who, as another vehicle appeared in her rearview mirror, conducted a hurried inspection of the driver’s body language only to hit a dead end, discovering the woman’s face expressionlessly staring at her cell phone. “Wait a second. She’s backing up now, but does that mean she’s getting ready to pull out or is she just trying to better align herself with the curb? That car behind me is breathing down my neck, but I don’t want to circle around the block again or we may lose this thing.” At press time, a passenger who had been dispatched to the woman’s window to squeeze her for information triumphantly reported that she spilled her guts and revealed she was just leaving.